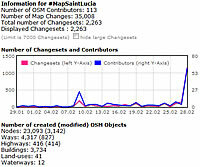 Map Saint Lucia 2016, a national Map-A-Thon organised by the Government of Saint Lucia as part of the country's 37th Independence Anniversary celebrations, has (so far) resulted in over 37,000 changes to the Open Street Map data of the island (stats credit: Pascal Neis). One hundred and sixteen persons, including some based outside Saint Lucia contributed their knowledge of roadways, waterways, land-use, landmarks and over 4,250 buildings. The basedata for Saint Lucia just got much richer, and since these data are #opendata the island has just improved its resilience against disaster, upgraded the experience for tourists and business travelers, and added to resources for planning and development analysis by professionals. Perhaps most importantly, Saint Lucia has increased the participation of its citizens in governance. Great! An gwo avansman!